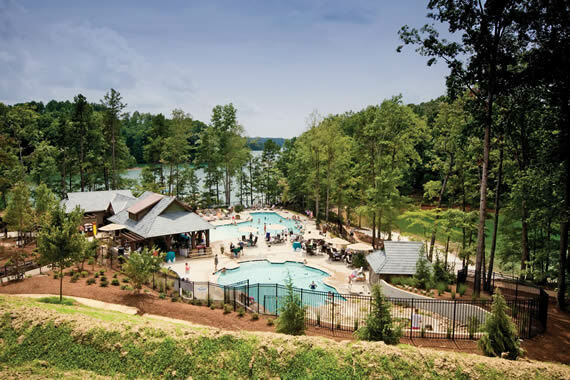 Set aside the Blue Ridge Mountains and on one of the most beautiful lakes in the Southeast, Keowee Springs is just 44 miles from the airport in award winning Greenville, SC; very convenient for traveling to and from the area and for out of town guests. With green spaces, trails, and parks, The Springs offers a scenic, rugged beauty in a luxurious lake living community. The beauty of the Cliffs at Keowee Springs is a perfect canvas for the creative talent of course designer Tom Fazio. Here, Mr. Fazio illustrates his award-winning genius with a design that meets the turn house eatery after hole 6 and again after hole 12. An extensive practice area allocates two acres to short game practice, including two chipping areas and a massive putting green in addition to a driving range with tree lined fairway views for more stimulating practice. The course offers a family tee (the perfect introduction to the game for children or neophytes), and also boasts a championship back tee to challenge even the most experienced players. In fact, there are several tees to choose from so you can play the same course from a variety of lengths. If you think the course is open and easy, just move back a set of tees! Another nice feature of course is that it is easily walkable. The Springs Clubhouse offers a well-designed combination of retail, wellness, and light dining. The Porch Bar is an inviting place to enjoy a light meal from “The Bistro” and drinks any time of day. The Pro Shop boasts a resort selection of clothing, not limited to golf attire. The Wellness area allows you to take in the practice area views, while working on your health and watching others shave a few strokes off their handicap. This newly remodeled eatery is located at the junction of holes 6 and 12, making stopping for refreshment very convenient, while enjoying a day of golf. After the game, the Bistro is also perfect for a dinner spent socializing with neighborhood friends, as well as enjoying pleasing golf course views and the Bistro’s menu. Anchored by a comfortable, sunshade pavilion, the two water recreation areas that comprise the Beach Club include a family pool with a two water slides, a white sand beach, a water sports area, and a lap pool for exercise classes and adult lap swimming. Boat slips are available at the Beach Club for those wishing to access the complex via Lake Keowee. Food and beverage service is available during summer months. The Vineyards and Springs marinas are conveniently located to both the south and north ends of the lake, allowing boaters and kayakers the opportunity to explore the 18,500 spring-fed acres of waterfalls, cliffs, deserted islands ringed with beaches, and fish-filled inlets. On Lake Keowee, you can tube, ski, wakeboard, or simply drift the day away, enjoying a picnic with friends.